"Harpers Ferry" redirects here. For other uses, see Harpers Ferry (disambiguation). Harpers Ferry, population 286 at the 2010 census, is a historic town in Jefferson County, West Virginia, United States, in the lower Shenandoah Valley. It was formerly spelled Harper's Ferry with an apostrophe — in the 18th century it was the ferry owned and run by Robert Harper — and that form continues to appear in some references. It is situated at the confluence of the Potomac and Shenandoah rivers, where the U.S. states of Maryland, Virginia, and West Virginia meet. 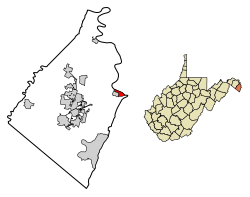 It is the easternmost town in West Virginia and during the Civil War the northernmost point of Confederate-controlled territory. 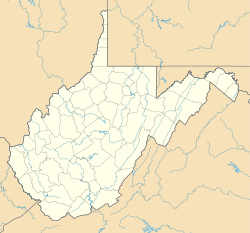 (The northernmost Virginia city of Wheeling was strongly anti-slavery, and was the first capital of the breakaway region that became West Virginia.) The town's original, lower section is on a flood plain created by the two rivers and surrounded by higher ground. The lower part of Harpers Ferry is within Harpers Ferry National Historical Park. Most of the remainder, which includes the more highly populated area, is included in the separate Harpers Ferry Historic District. Two other National Register of Historic Places properties adjoin the town: the B & O Railroad Potomac River Crossing and St. Peter's Roman Catholic Church. Because of its geography, Harpers Ferry was a vitally important junction point. In colonial times and through the early U.S. years, its location at the junction of two rivers, and the feasibility of a ferry – the first regular ferry across the Potomac, antedating the founding of Washington – made it a natural site of commerce. Harpers Ferry has a commanding central location on the Chesapeake and Ohio Canal, running alongside the Potomac and avoiding its rapids, linking Washington with points west. 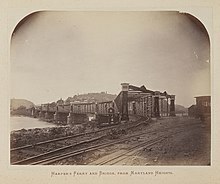 The word "ferry" in the town's name — the ferry ended in 1824, when a covered wooden road bridge was built — conceals the fact that Harpers Ferry is the site of the first and for many years the only railroad bridge across the Potomac River, the Baltimore & Ohio Railroad's bridge, built in 1836–37. It is also the site of the first railroad intersection in the United States, where the older Baltimore & Ohio was met by the newer Winchester and Potomac Railroad. It thus was, at the time the Civil War began, the only railroad link between the Northern and Southern states. It was a natural conduit for Union incursions into the South; one of Stonewall Jackson's first actions was the Great Train Raid of 1861, in which he disabled the Baltimore and Ohio Railroad for almost a year by destroying infrastructure and stealing rolling stock. At the mouth of the Shenandoah Valley, important Civil War battles took place nearby. Not only was Harpers Ferry a vital north-south route, it also commanded the routes – the railroad and the canal — connecting Washington with points west and the Ohio Valley. Vital telegraph lines connecting Washington with points west also went through Harpers Ferry. Historically, Harpers Ferry is best known for John Brown's raid in 1859, in which he attempted to use the town and the weapons in its Federal Armory (munitions plant) as the base for a slave revolt, planned to expand south into Virginia. At that time and until 1863, it was part of Virginia. In the 20th and 21st centuries, the Appalachian Trail Conservancy (ATC) headquarters is in Harpers Ferry. The Appalachian Trail passes directly through town, which some consider the psychological midpoint of the trail, although the exact physical midpoint is farther north, in Pennsylvania. Uniquely, the towns of Harpers Ferry and Bolivar partnered with the ATC to be declared a united Appalachian Trail Community. Other popular outdoor activities include white water rafting, fishing, mountain biking, tubing, canoeing, hiking, zip lining, and rock climbing. Industrialization continued in 1833 when the Chesapeake & Ohio Canal reached Harpers Ferry, linking it with Washington, D.C. A year later, the Baltimore & Ohio Railroad began service through the town. On October 16, 1859, the abolitionist John Brown led a group of 21 men in a raid on the arsenal. Five of the men were black: three free black men, one freed slave and one fugitive slave. During this time assisting fugitive slaves was illegal under the Fugitive Slave Act. Brown attacked and captured several buildings; hoping to secure the weapons depot and arm the slaves, starting a revolt across the south. Brown also brought 1,000 steel pikes, which were forged in Connecticut by a blacksmith and abolitionists sympathizer, Charles Blair; however, the pikes would see no action as Brown failed to rally the slaves to revolt (https://www.kshs.org/kansapedia/john-brown-pike/10239). The first shot of the raid mortally wounded Heyward Shepherd, a free black man who had been a night baggage porter for the B&O Railroad running through Harpers Ferry attempting to warn the slave owners near the armory. The noise from that shot alerted Dr. John Starry shortly after 1:00 am. He walked from his nearby home to investigate the shooting and was confronted by Brown's men. Starry stated that he was a doctor but could do nothing more for Shepherd, and Brown's men allowed him to leave. Instead of going home, Starry went to the livery and rode to neighboring towns and villages, alerting residents to the raid. When Starry reached nearby Charles Town, the church bells were rung to arouse the citizens from their sleep. John Brown's men were quickly pinned down by local citizens and militia, and forced to take refuge in the engine house adjacent to the armory. The secretary of war asked for the assistance of the Navy Department for a unit of United States Marines, the nearest troops. Lieutenant Israel Greene was ordered to take a force of 86 Marines to the town. In need of an officer to lead the expedition, U.S. Army Lieutenant Colonel Robert E. Lee was found on leave nearby and was assigned as commander along with Lt. J. E. B. Stuart as his aide-de-camp. Lee led the unit in his regular civilian clothes, as none of his uniforms were available when he accepted the command. The whole contingent arrived by train on October 18, and after negotiation failed they stormed the fire house and captured most of the raiders, killing a few and suffering a single casualty themselves. Brown was tried for treason against the Commonwealth of Virginia, convicted and hanged in nearby Charles Town. Starry's testimony was integral to his conviction. Following the prosecution (by Andrew Hunter), "John Brown captured the attention of the nation like no other abolitionist or slave owner before or since." The Marines returned to their barracks and Col. Lee returned to finish his leave. The Civil War was disastrous for Harpers Ferry, which changed hands eight times between 1861 and 1865. Because of the town's strategic location on the railroad and at the northern end of the Shenandoah Valley, both Union and Confederate troops moved through Harpers Ferry frequently. The town's garrison of 14,000 Federal troops played a key role in the Confederate invasion of Maryland in September 1862. Gen. Robert E. Lee did not want to continue on to Maryland without capturing the town. It was on his supply line and could control one of his possible routes of retreat if the invasion did not go well. Dividing his army of approximately 40,000 into four sections, Lee used the cover of the mountains to send three columns under Stonewall Jackson to surround and capture the town. The Battle of Harpers Ferry started with light fighting September 13 as the Confederates tried to capture the Maryland Heights to the northeast, while John Walker moved back over the Potomac to capture Loudoun Heights south of town. After a Confederate artillery bombardment on September 14 and 15, the Federal garrison surrendered. With 12,419 Federal troops captured by Jackson, the surrender at Harpers Ferry was the largest surrender of U.S. military personnel until the Battle of Bataan in World War II. Because of the delay in capturing Harpers Ferry and the movement of Federal forces to the west, Lee was forced to regroup at the town of Sharpsburg. Two days later he commanded troops in the Battle of Antietam, which had the highest number of deaths among troops of any single day in United States military history. 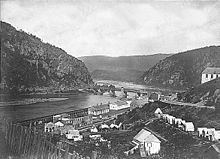 By July 1864, the Union again had control of Harpers Ferry. On 4 July 1864, the Union commanding Gen. Franz Sigel withdrew his troops to Maryland Heights. From there he resisted Jubal Anderson Early's attempt to enter the town and drive the Federal garrison from Maryland Heights. On August 15, 1906, author and scholar W. E. B. Du Bois led the first meeting on American soil of the newly founded Niagara Movement. The conference was held at the campus of Storer College, a historically black college that operated until 1955. (The campus became part of Harpers Ferry National Historical Park.) The three-day gathering, which was held to work for civil rights for African Americans, was later described by DuBois as "one of the greatest meetings that American Negroes ever held." Attendees of the 1906 meeting walked from Storer College to the nearby farm of the Murphy family. It was the site of the historic fort and armory where John Brown's quest to free four million enslaved African Americans reached its climax. Harper's Ferry is traditionally the psychological midpoint on the Appalachian Trail, though the mileage is not equal. Population of the small town declined in the 20th century. In 1944 Congress authorized the establishment of Harpers Ferry National Historical Park, to take in most of the town and be administered by the National Park Service. The majority of the existing homes in Harpers Ferry (including Charmadoah) are historic. Some are registered in the National Register of Historic Places. In 1950 Harpers Ferry had a population of 822. On July 23, 2015, a fire broke out in downtown Harpers Ferry, destroying eight or nine businesses and two apartments in two historic buildings. The buildings are being rebuilt. Railroad bridge and Maryland Heights opposite Harpers Ferry; also visible is the painted Mennen's Borated Talcum Toilet Powder advertisement on the cliffs, painted around 1903 to 1906. Bridge leading into Harpers Ferry from Maryland in February 2009. Amtrak provides service to Harpers Ferry two times a day (once in each direction) on the Capitol Limited. It is also served by MARC on the Brunswick Line. 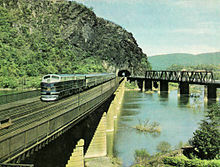 The city's passenger rail station is at the West Virginia end of the historic railroad bridge across the Potomac River. In addition about 40-50 CSX freight trains daily pass through Harpers Ferry and over the bridge spanning the Potomac River. Harpers Ferry is located at 39°19′31″N 77°44′37″W﻿ / ﻿39.32528°N 77.74361°W﻿ / 39.32528; -77.74361 (39.325398, -77.743599), at the confluence of the Shenandoah River, left, and the Potomac River, right. Across the Shenandoah lie the Loudoun Heights, in Virginia, while across the Potomac are the Maryland Heights, in Maryland. According to the United States Census Bureau, the town has a total area of 0.61 square miles (1.58 km2), of which, 0.53 square miles (1.37 km2) is land and 0.08 square miles (0.21 km2) is water. Some properties are currently threatened by development. From most of Harpers Ferry, a fading advertisement for Mennen's Borated Talcum Toilet Powder painted on the cliff face of Maryland Heights decades ago is still visible. The climate in this area is characterized by hot, humid summers and generally mild to cool winters, with yearly snowfall averaging 20.7 inches. According to the Köppen Climate Classification system, Harpers Ferry has a humid subtropical climate, abbreviated "Cfa" on climate maps. Aerial view, looking east in October 1974. As of the census of 2010, there were 286 people, 131 households, and 78 families residing in the town. The population density was 539.6 inhabitants per square mile (208.3/km2). There were 175 housing units at an average density of 330.2 per square mile (127.5/km2). The racial makeup of the town was 94% White, 4% African American, 1% Native American, 0% from other races, and 1% from two or more races. Hispanic or Latino of any race were 1% of the population. There were 131 households of which 21% had children under the age of 18 living with them, 44% were married couples living together, 13% had a female householder with no husband present, 3% had a male householder with no wife present, and 41% were non-families. 29% of all households were made up of individuals and 15% had someone living alone who was 65 years of age or older. The average household size was 2.18 and the average family size was 2.69. The median age in the town was 52 years. 17% of residents were under the age of 18; 3% were between the ages of 18 and 24; 19% were from 25 to 44; 38% were from 45 to 64; and 23% were 65 years of age or older. The gender makeup of the town was 49.3% male and 50.7% female. In the census of 2000, there were 307 people, 153 households and 89 families residing in the town. The median income for a household in the town was $52,344, and the median income for a family was $70,313. Federally, Harpers Ferry is part of West Virginia's 2nd congressional district and is represented by Alex Mooney (R) in the United States House of Representatives. Mooney was first elected in 2014. ^ For example, Horace Greeley, The American Conflict: A History of the Great Rebellion in the United States of America, 1860–64. Volume: 1. (1866), p. 279; French Ensor Chadwick, Causes of the Civil War, 1859–1861 (1906) p. 74; Allan Nevins, The Emergence of Lincoln (1950) v, 2 ch 3; James M. McPherson, Battle Cry of Freedom: The Civil War Era (1988), p. 201; Stephen W. Sears, Landscape Turned Red: The Battle of Antietam (2003) p. 116. ^ "Harpers Ferry Town Website". Archived from the original on 2007-07-16. Retrieved 2007-07-19. ^ "Hikes - Harpers Ferry National Historical Park (U.S. National Park Service)". www.nps.gov. Archived from the original on 4 October 2017. Retrieved 28 April 2018. ^ "Headquarters and psychological mid-point of the Appalachian Trail, Harpers Ferry, West Virginia". loc.gov. Archived from the original on 21 September 2017. Retrieved 28 April 2018. ^ "Harper's Ferry & Bolivar, West Virginia: An Appalachian Trail Community". Appalachian Trail Conservancy. Retrieved 2018-05-24. ^ O’Dell, C. (1995). Pioneers of Old Frederick County, Virginia. Walsworth Publishing Company. ^ Beckman, J. A. (2006). Harpers Ferry. Arcadia Publishing. ^ Gale, K. (2006). Lewis and Clark Road Trips: Exploring the Trail Across America. River Junction Press LLC. ^ Congressional Serial Set. (1868). U.S. Government Printing Office. ^ Hahn, T. F. (n.d.). Towpath Guide to the Chesapeake & Ohio Canal: Harpers Ferry to Fort Frederick. American Canal and Transportation Center. ^ Sullivan, David (1997). The United States Marine Corps in the Civil War – The First Year. White Mane Publishing Company, Inc. pp. 1–27. ISBN 978-1-57249-040-6. ^ a b Tucker, S. C. (2013). American Civil War: The Definitive Encyclopedia and Document Collection [6 volumes]: The Definitive Encyclopedia and Document Collection. ABC-CLIO. ^ "Harpers Ferry NHP Stonewall Jackson Woodward engraving published in the Aldine Magazine, Vol. VI, No. 7 (July 1873) p. 134". Archived from the original on 2006-06-20. ^ Gilbert, David T. (2006-08-11). "The Niagara Movement at Harpers Ferry". National Park Service. Archived from the original on 2007-10-27. Retrieved 2007-10-09. ^ Hedgpeth, Dana; Woodrow Cox, John (July 23, 2015). "Fire destroys businesses in historic area of Harpers Ferry". The Washington Post. Archived from the original on 25 July 2015. Retrieved 25 July 2015. ^ "US Gazetteer files 2010". United States Census Bureau. Archived from the original on 2011-02-20. Retrieved 2013-01-24. ^ "Development Threatens Park Experience - Harpers Ferry National Historical Park (U.S. National Park Service)". Archived from the original on 4 November 2012. Retrieved 15 September 2016. ^ "Harpers Ferry, West Virginia Köppen Climate Classification (Weatherbase)". Archived from the original on 21 October 2016. Retrieved 15 September 2016. ^ Steven Lubet, The "Colored Hero" of Harper's Ferry: John Anthony Copeland and the War Against Slavery (Cambridge University Press, 2015) p.181. ^ Hinton, Richard J. (1894). John Brown and His Men. Funk and Wagnalls. pp. 507–5088. ^ "Houston, Drusilla Dunjee (1876–1941)". Oklahoma History Center. Archived from the original on 4 February 2017. Retrieved 4 February 2017. ^ "The Conspirators Biographies". William Elsey Connelley, John Brown (Topeka: Crane & Company, 1900), 340-347; and Oswald Garrison Villard, John Brown 1800-1859: A Biography Fifty Years After (1910, reprint, Gloucester, MA: Peter Smith, 1965), 678-687. 2008. Archived from the original on 2009-07-09. Retrieved 2010-05-24. Wikimedia Commons has media related to Harpers Ferry, West Virginia. Wikisource has the text of the 1911 Encyclopædia Britannica article Harper's Ferry.